This page has been viewed 11 times this month, and 1680 times total. Cartoon Characters: Littlefoot, Cera, Ducky, Petrie, Mutt, Iguanadon, Spike, Cera's Father, Grandma, Mother Quetzalcoatlus, Hyp, Hyp's Father, Stegosaurus, Velociraptor, Nod. Voice Actors: Scott McAfee, Candace Hutson, Heather Hogan, Jeff Bennett, Rob Paulsen, John Ingle. Directed By Roy Smith, Graham Morris. Produced By Zahra Dowlatabadi, Roy Smith. Written By John Loy, John Ludin, Dev Ross. Music: Michael Tavera, James Horner. Originally Released in 1995 (Estimate). Do you have anything to add to this page? Have we made any mistakes... or do you have any additional information about The Land Before Time III: The Time Of The Great Giving? If so, we would love to hear from you. Please send us a quick note with your additions or corrections to this page, and we will make the corrections as soon as possible! 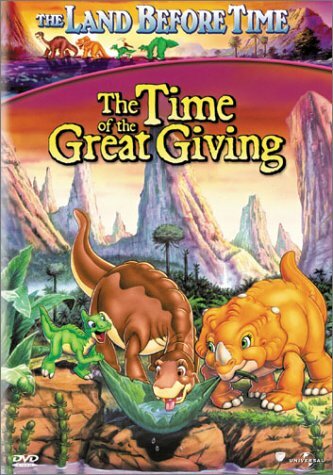 Do you love The Land Before Time III: The Time Of The Great Giving, or do you think it is the worst cartoon ever? Let us know what you think! Surely you have an opinion... so share what you think. Take a minute and post your own comments about this cartoon here. The Land Before Time III: The Time Of The Great Giving by Big Cartoon DataBase is licensed under a Creative Commons Attribution-NonCommercial-ShareAlike 4.0 International License.